A controversial cartoon printed in the Sunday edition of Indian newspaper Marathi Daily has put the owner, editor, and cartoonist in hot water with the Islamic community. 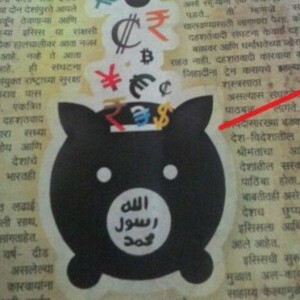 Called “blasphemous” and religiously insensitive, the cartoon accompanied an article entitled “ISIS Money” and depicted the image of a piggybank with Urdu — the national language of Pakistan — text boldly written on its stomach. In response to the publication of the cartoon, several members of the Muslim community expressed outrage at the image; one person issued a formal complaint against the newspaper and others protested by burning copies of the edition. “The newspaper has hurt our religious feelings. We have lodged a complaint against the concerned persons of the newspaper,” said the complainant. Whoever, with deliberate and malicious intention of outraging the religious feelings of any class of citizens of India, by words, either spoken or written, or by signs or by visible representations or otherwise insults or attempts to insult the religion or the religious beliefs of that class, shall be punished with imprisonment of either description for a term which may extend to three years, or with fine, or with both. At this time no arrests have been made, but the newspaper has issued a formal apology on their website and assured the public that actions would be taken against the employees who published the cartoon. “It was an unintentional mistake and we had no intention of hurting our brothers from the community,” wrote the Marathi Daily. Although the apology was meant to appease the members of the Islamic community, some Muslim citizens have declared that the apology and legal investigation are unnecessary because ISIS is not representative of the Muslim religion. On social media, several people have come forward expressing their outrage that the newspaper would kowtow to those who would stifle free speech.